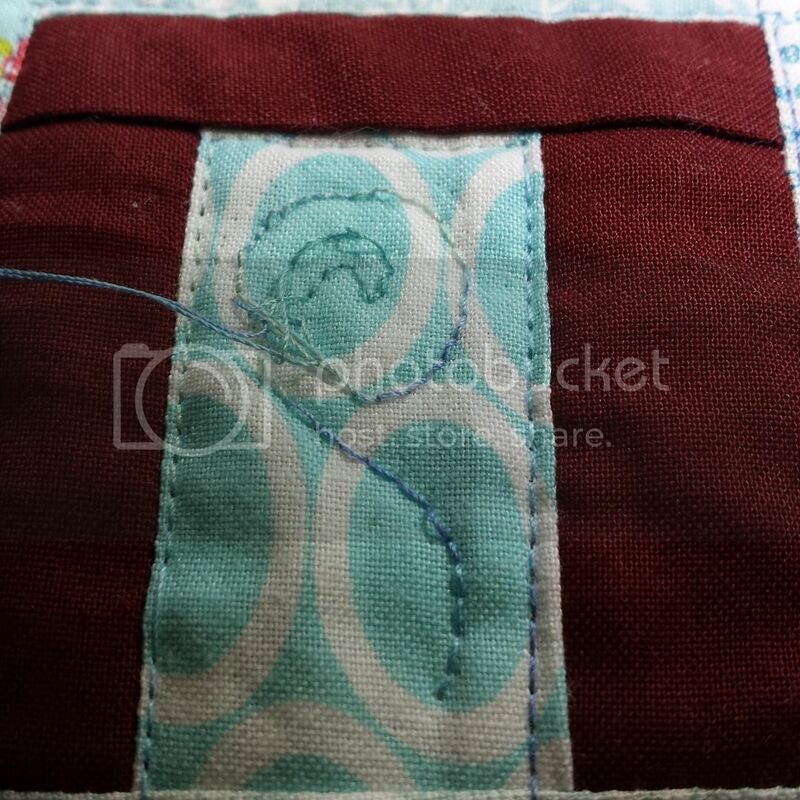 It has been a long time since I've posted about quilting. I'm still in the throws of this terrible episode of depression, waiting for the anti-depressants that I don't want to be taking to kick in, and my sewing room doesn't hold any fascination for me at the moment, I don't know why. I did take some time to do some quilting on Silent Scream #1 though, and got quite a way through. I'm FMQing swirls and little pointy bits (that's my very catchy title for the stitch pattern) using my lovely Janome Atelier 5 with the darning foot and feed dogs down. 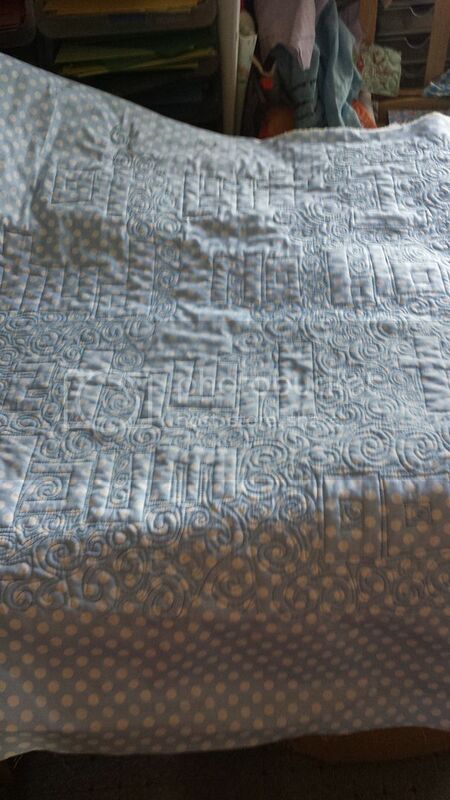 I'm using a Guttermann's variegated thread in different shades of blue and quilting around the letters, not over them. Here you can see some of the pointy bits I'm talking about! 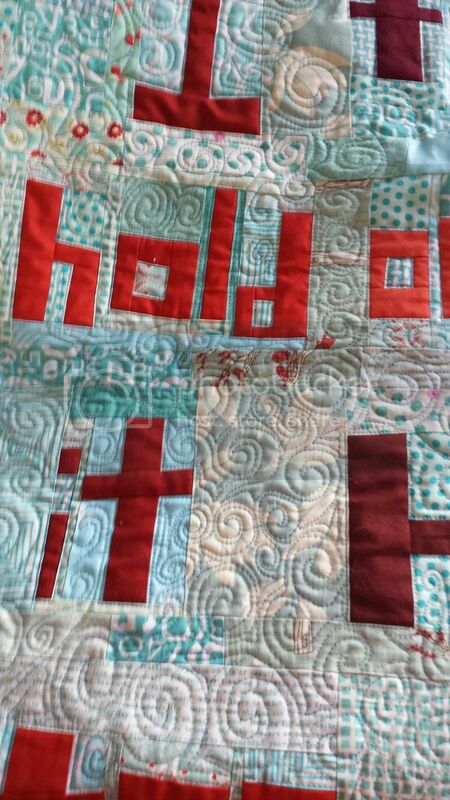 I'd been quilting for a couple of hours, on and off as I have to take frequent coffee-and-pointless-flick-through-social-media breaks. Then this happened. I cleaned out the bobbin case, the Janome demands this a lot more frequently than my Husqvarna ever did, I changed the needle, rethreaded the machine and used a new bobbin. Nope, not happening. So I gave up. I must be more than three-quarters of the way through here! Since taking these photos, I went back to the quilting and... it was fine. So Janome was just having a temper tantrum then. I've also started free-piecing Silent Scream #2 (oh yes, I'm going for a series here). Can you name this tune? A bit unfair really as only the Brits (and maybe Irish?) would know this band and their songs. In the midst of all the crap going off with my mental health, I received a lovely parcel from the lovely Kerry. She left me (me personally, she didn't emigrate, she left ME) back in January for a new life in Canada and I miss her so this really brought a smile to my face. There were also chocolate coins (Canadian dollars of course), a Canadian quilting magazine and some Peeps. I've always wondered what Peeps are and now I know. Really f*****g scary is what they are! Thanks Kerry, I will reciprocate, I'm just being particularly crap at the minute and we all know I'm crap at the best of times. You may be feeling c*%p at the moment, but the fact that you keep going with your projects is a really positive thing. 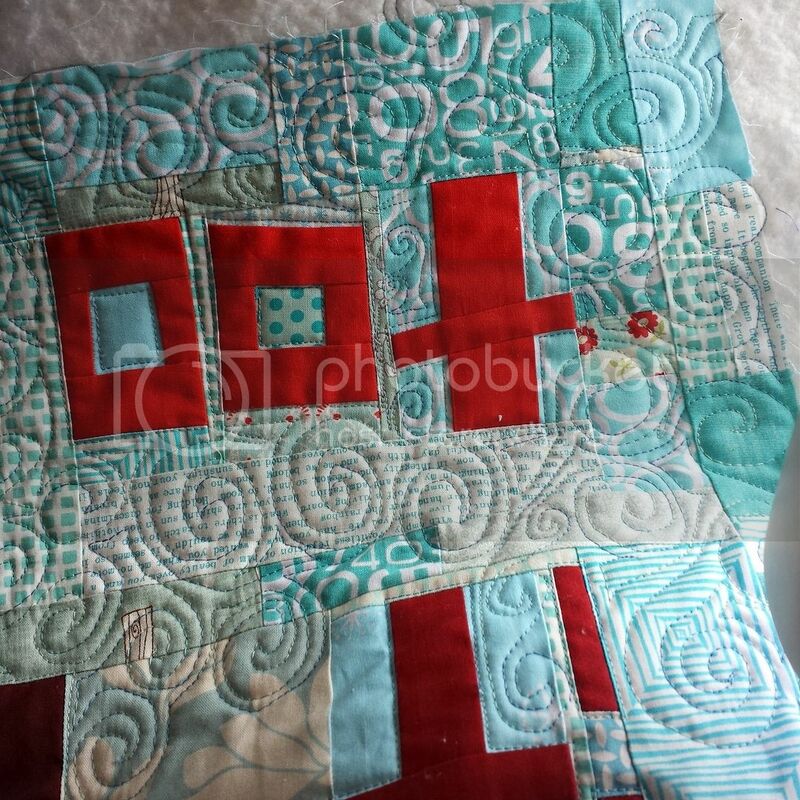 I really like your 'swirls and pointy bits' quilting - it looks fantastic! I am thinking of starting some small patchwork hexagons but have only got as far as cutting out and putting in the paper. You are an inspiration! I'm sorry to hear it's so difficult at the moment. Hold on, you _will_ get through. well done, your FMQ looks really good. Sorry to hear about your battle with depression, hopefully the meds will kick in soon. Sewing machines always scare me, and mine seems to go wrong as soon as I try to do something really important and never on a test piece! 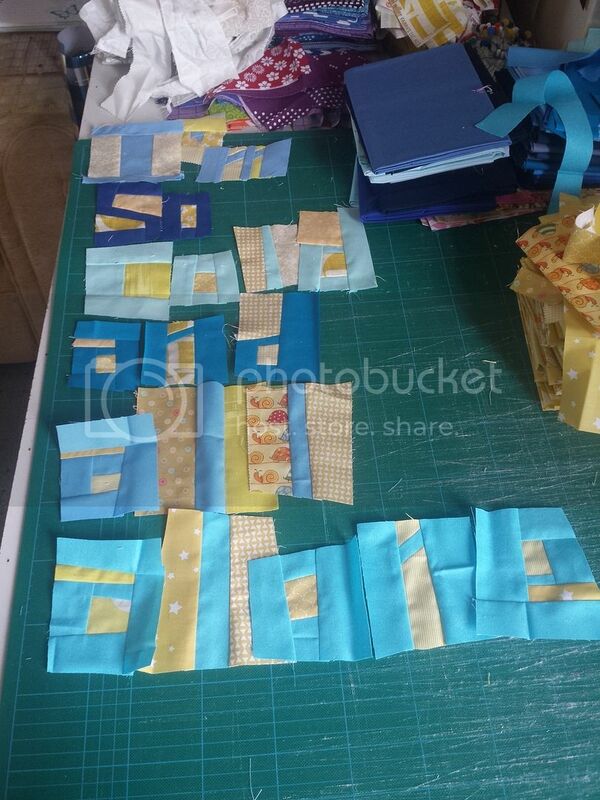 I really admire your patience to do all the quilting....it's looking great! I'm in a similar battle with my sewing machine at the moment and like yours, one day "she" behaves and the next she is having a tantrum. I can only hope today is one of the better days. How lovely to get a surprise parcel from your friend. Friends are the best, even if they are on the other side of an ocean :(! Awww. I know that feeling, when nothing holds fascination and you just want to curl up and hide from the world. I hope you feel better soon! Wendy, your quilting is gorgeous! I do hope things work out with your sewing machine - that is always frustrating. As for Peeps... My eldest son loves them. However, it seems I am only to buy them for him at Easter (when they traditionally were sold.) I've never been a fan of them. Most people I know either really like them or they really don't. ;) I am sending big hugs your way! do hope the tablets start helping soon with your depression, will keep you in my thoughts and prayers. You were doing a great job until the machine threw that temper tantrum. 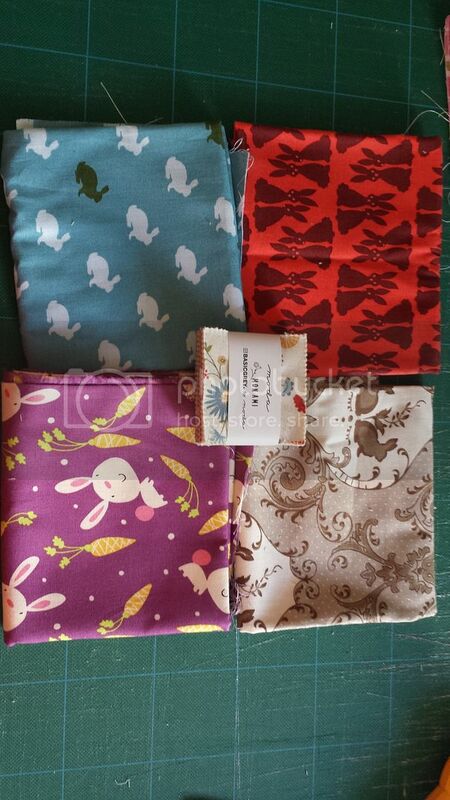 When I'm depressed I can't do my stitching or quilting at all. Well, maybe mindless stitching. Good for you. Amazing quilting! You might be feeling like crap, but it doesn't show in your crafting. Can't wait to see Silent Scream #2! Hang on in there. Sometimes you think the tablets haven't started to work, but they have, you just don't see it yet. And on a plus point you are making some really creative stuff.